Ah, it’s summertime! Time to save up your hard-earned cash so you can spend it all at some awesome summer concerts headed our way! Enough of the gibber-gabber though! Let’s get to the shows! A concert presented by SKY Entertainment, Wheesung and Moon Myeong Jin are scheduled to perform in the U.S. for the first time! They are set to embark on a mini-tour around the United States, making stops in New Jersey, Chicago, and of course, Los Angeles! Here’s where you can find more info and purchase tickets! Okay, not gonna lie. 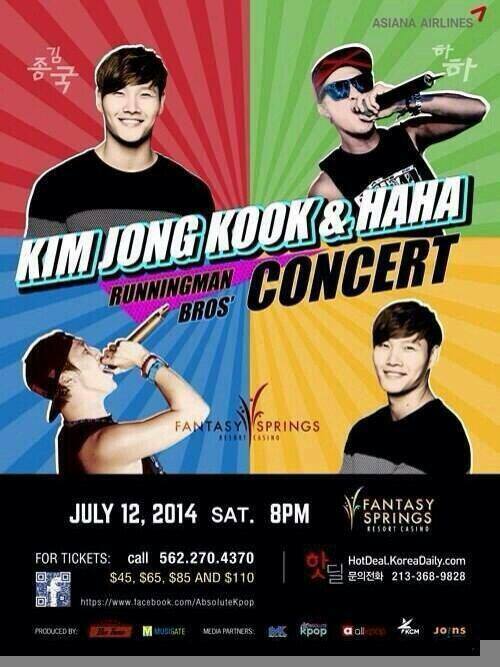 Kind of excited about this one since we never get the chance to see Running Man members in the United States! They are only making one stop on this tour though, and that’s at the Fantasy Springs Resort Casino in California. The concert is set for Saturday, July 12th! It’s time again for the biggest Kpop convention this side of Seoul! KCON is back and scheduled to happen at the Los Angeles Memorial Sports Arena on August 9th-10th! Yes, that’s right! This year, the crazy-awesome concert has been epically upgraded to a two-day event! The lineup has just been announced, and will feature artists like IU, BTS, Teen Top, Jung Joon Young, Vixx, SNSD and Gdragon! Excited yet?!? For more info, be sure to visit KCON’s official website! Tickets Combo packages are scheduled to go on sale on July 1st, with individual ticket sales following on July 3rd! So, get out there and enjoy a summer full of Kpop!